A year ago this month a little new bundle of joy was born into a caring a loving family, that of my very good friend Jazmine. Her little one, Zoe, will be baptized and celebrated this weekend in a big way so she asked me to design something sweet and fun to commemorate the event. 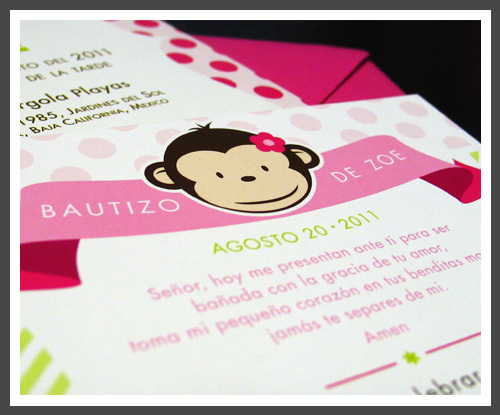 Jazmine used the so adorable Mod Monkey motif for all her decorations so it was a must to use on the invitations*. 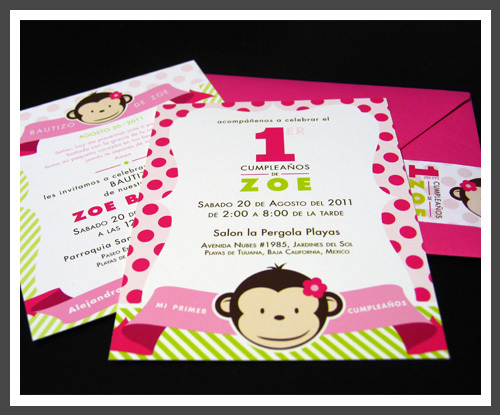 In this double-sided Birthday and Baptism Invitation, the color palette was very girly, of course, with a mixture of soft tints for the baptism side and bright pops of pink and lime green for the birthday celebration side. 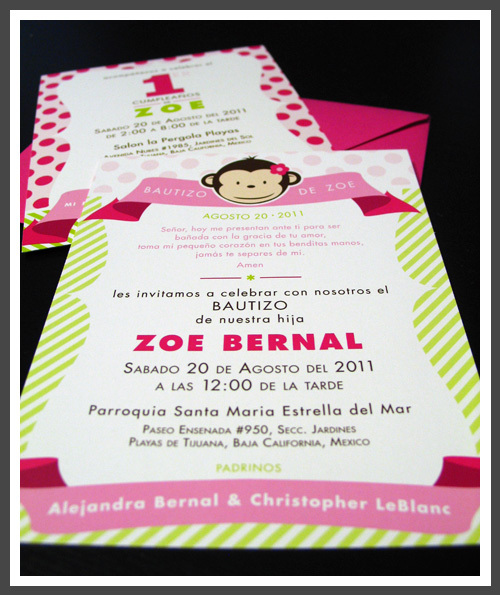 An array of graphic elements such as diagonal lines and polka-dots accompanied by flowing banners holding the important information added to the playfulness of the invitations. 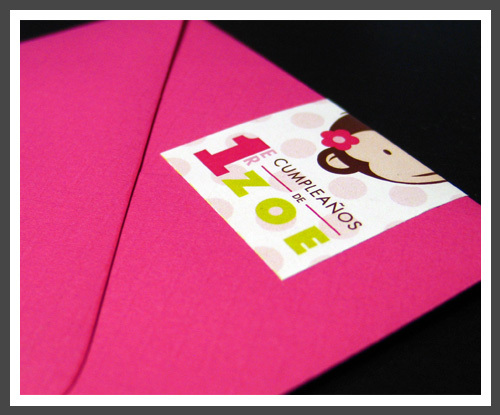 A custom logo was created as well which was used on the address labels and other designs created for the decor. And of course the address label is a must for the final touch. 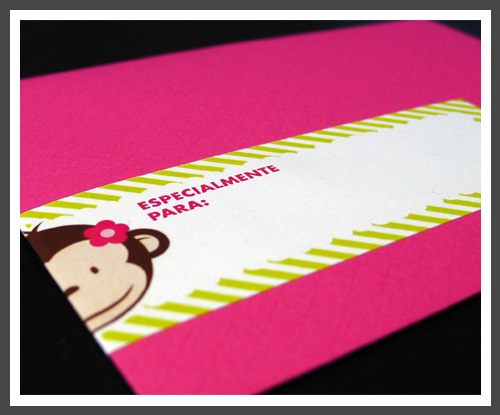 I reflected the Mod Monkey motif so it showed on both the front and back of the address label. 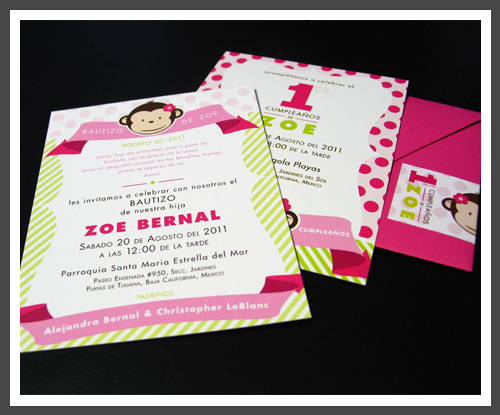 These bright and vibrant Magenta envelopes from the Eames Furniture Collection, which I also used on these Owl Baby Shower Invitations, brought the invitation suite together. May this baptism and birthday celebration be as special as the many happy years to come! Unfortunately, I can't attend being that it's the same day as my in-law's 50th Anniversary Celebration (and in different cities), but I'll have little Zoe and your family in might heart. Have Fun!! Have a great weekend everyone. Tomorrow I'm off to Baja...the celebration begins! *Disclaimer: this was a personal, non-commercial invitation design. 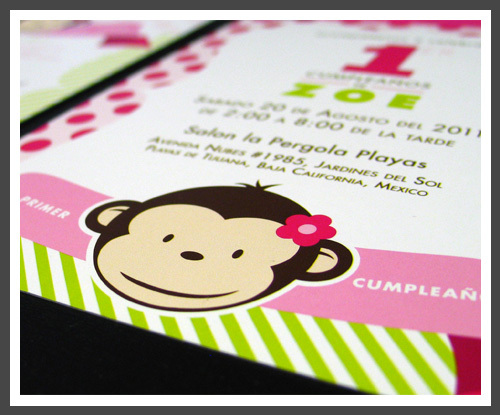 The Mod Monkey motif was licensed for this purpose only and will not be sold under the LizzyB Loves brand.